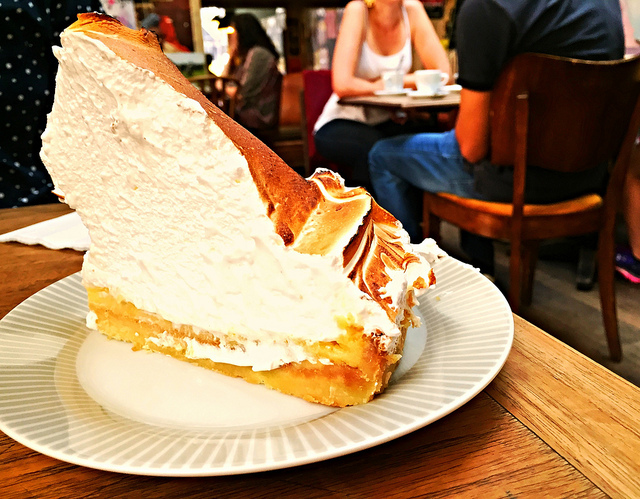 Le Loir dans le Theiere is famous for its towering slices of lemon meringue pie, a perfectly whipped and browned sweet meringue on top of sour lemon crust. The pie is delicious, but the atmosphere in Le Loir adds to the experience. It has a trendy San Francisco or Portland coffee shop feel with Parisians sipping tea in front of laptops and posters of the latest concerts and events covering the wall. See our complete guide to Paris Daytime Eats: Top 7 Under $7. Lemon meringue pie... or rather meringue pie with lemon. It’s amazing. ($$) A slice of pie costs around 7 euro. Adding tea or coffee is also a bit steep, so come caffeinated to save a few bucks.